Gain insight into the severity and frequency of errors and warnings, the health of Replica set nodes, and failures between Shards. Mitigate security threats by identifying issues with failed logins and geo-location of clients using the Sumo Logic App for MongoDB. 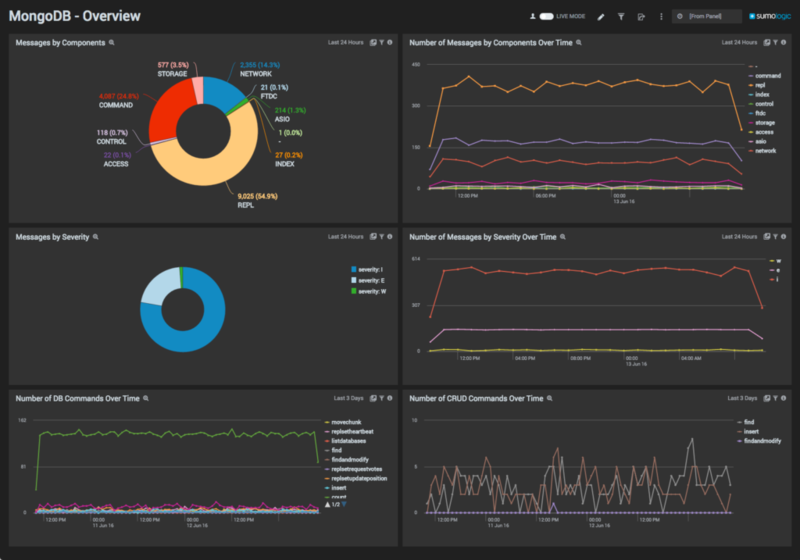 Monitor and detect slow MongoDB queries, and identify inefficient queries and operations without the overhead of a profiler. 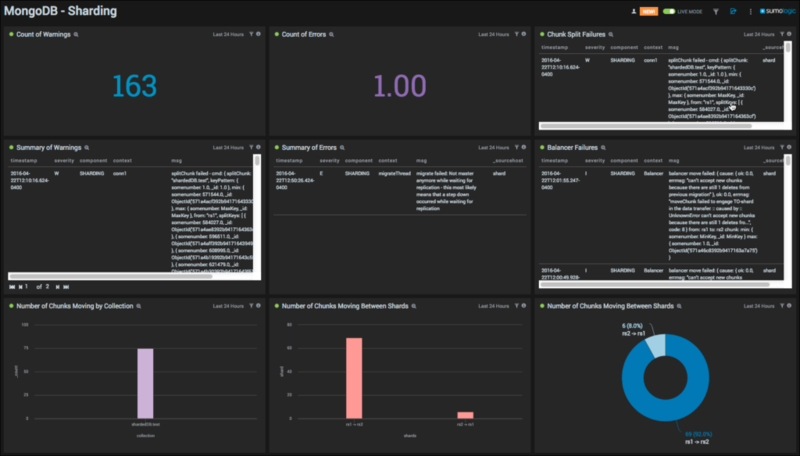 Get a complete overview of your MongoDB deployment on a single dashboard. Monitor overall health of your deployment, check slow server status, quickly spot errors and stopped servers, and identify slow execution times. View Messages by Components to see the type and number of messages by components. 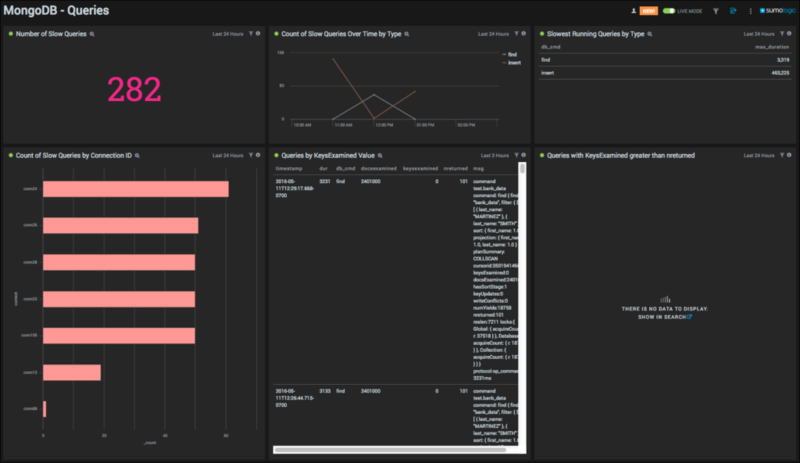 Monitor messages by components over time, check messages by severity and severity over time. See the number of DB commands over time, and view the number of CRUD commands over time. Stopped and UP servers displayed in a tables that detail host, event time, server status, and remarks. Slowest execution time (in MS) of DB commands with details on the command and max duration. Quickly identify slow queries by connection ID or by type, and spot trends over time. View errors and warnings, exit events, and socket exceptions. Get a map view of failed logins, client requests and connections, open connections and more. Number of slow queries, 10 slowest queries by connection ID or type, and slowest queries by connection ID or type plotted over time. Queries by KeysExamined value and KeysExamined greater than nreturned. Fatal errors and warnings by component, socker exceptions and timeout events. Monitor replication events and spot warnings and errors, for primary and secondary nodes. View warnings in a table chart including details on timestamp, severity, component, context, message, and source host for the last three days. Check the number of chunks moving by collection for the last three days. Replication events and replica nodes. Count of warnings for the last three days.